Before you get started with any gardening project, make sure you have the tools to get your tasks done right. Getting your salad or flower garden in a healthy shape will be more convenient and rewarding when you use the right tools. One of the must-have gardening equipment to own is today’s one of the best-selling wheelbarrow: the Worx Aerocart Multifunction Wheelbarrow. Not all wheelbarrows in the market are of good quality. Some rust easily, while others have low capacities. Whatever gardening or farming projects you intend to do, a versatile wheelbarrow is helpful. Not only can it be used for transporting garden items, but it can also be used for storing tools. While most wheelbarrows have looped handles that double as a stand, the Worx Aerocart Multifunction Wheelbarrow has a convertible design. This is probably one of the unique and most advanced wheelbarrows that you can find. That is because the Worx Aerocart Multifunction Wheelbarrow can be transformed into a cart and a dolly. Let’s learn more about its features. 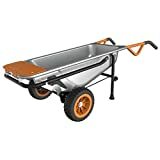 The Worx Aerocart Multifunction Wheelbarrow has an approximate weight of 300 pounds and an all-steel construction that makes it last for long and can prevent rust formation. Similar to its weight, the Worx Aerocart Multifunction Wheelbarrow has a maximum weight capacity of 300 pounds. As such, you can transport various kinds of items. The design is also carefully thought of as the laws of physics have been applied. This unique style adjusts the center of gravity to balance the load’s weight for easy maneuvering and transporting. The tires of the Worx Aerocart Multifunction Wheelbarrow are large and don’t require inflating. They don’t get flat too, so they’re basically zero maintenance. Additionally, the wheels are three inches wide and 10 inches in diameter. The Worx Aerocart Multifunction Wheelbarrow has an ergonomic construction, and its design makes the actual load being carried feels lighter. For example, a 200-pound item can feel like 17 pounds only, so transporting tasks become a lot easier. Assembling the parts and converting the Worx Aerocart Multifunction Wheelbarrow into a cart or wagon is fast as well. In fact, it can be done in seconds. The parts attach easily and securely without the need for additional tools. One of the best features of the Worx Aerocart Multifunction Wheelbarrow that no other wheelbarrows in the market today have is its versatility. It is a highly multifunctional work system for carrying and lifting objects. It can be converted into an extended dolly, trailer mover, flower pot mover, cylinder carrier, bag holder, and more. These are all made possible by the additional parts which can be attached easily. The extendable fold-out arm can be used for transporting flower pots, straw bales, and other large, complicated objects. It also comes with detachable seat for user’s comfort and resting place for some items. Additionally, the Worx Aerocart Multifunction Wheelbarrow features an innovative cup holder for added convenience. All these additional parts are easily attached or detached without the need for tools. Coming in at a price that might not be favorable for some people, the Worx Aerocart Multifunction Wheelbarrow is a highly versatile tool that has detachable parts. Hence, although it can’t hold heavier objects, these parts make it possible to do many tasks; it can be used as a dolly, a stone hauler, and a plant lifter. Aside from multi-functionality, the Worx Aerocart Multifunction Wheelbarrow makes lifting and carrying tasks more convenient. It is easy to use and assemble, as no additional tools are required when assembling the parts. What is worth noting is that it can last for a long time as it is constructed with sturdy materials, while the wheels are maintenance-free. While the Worx Aerocart Multifunction Wheelbarrow seems like an excellent garden tool for all carrying tasks, some users might want a cheaper, simpler one. A good alternative that has these features is the Gorilla Carts Poly Garden Dump Cart. As similar to the Worx Aerocart, it is made with steel materials that can support and carry loads, but it has a higher load capacity. The Gorilla Carts Poly Garden Dump Cart can carry a load as heavy as 600 pounds. This product also has a release mechanism that makes dumping and tilting quick and easy. The Gorilla Carts Poly Garden Dump Cart has dimensions of 38.7 by 20 inches. Its frame is easy to assemble while providing improved maneuverability. The four, 10-inch tires smoothly roll out, and it can support the loads even in rocky pavements, muddy farms, and more. Whether you need to transport soil or plants, the Gorilla Carts Poly Garden Dump Cart is convenient and allows tasks to be done in minutes. Additionally, its handle is padded for comfort, and a one-year limited warranty backs the product. Overall, the Worx Aerocart Multifunction Wheelbarrow is an excellent product for all lifting and transporting tasks in the garden and farms. It can also be converted into a cart and dolly for various carrying tasks. Assembling the parts is easy and does not require additional tools or professional help. Additionally, the bonus parts make gardening more convenient. Despite the extreme multi-functionality of Worx Aerocart Multifunction Wheelbarrow, some users still want a simpler, more affordable wheelbarrow. The Gorilla Carts Poly Garden Dump Cart is a good alternative because it has a higher capacity. However, compared to the Worx Aerocart Multifunction Wheelbarrow, it has less versatility. That being said, even though the Worx Aerocart Multifunction Wheelbarrow is quite expensive compared to average wheelbarrows, its additional features make it all worth it. It is not an ordinary wheelbarrow. It is a highly multi-functional product that makes gardening more fun and convenient. No wonder it stands out in the market today. Try it now and make gardening an enjoyable and rewarding hobby!